Bigfork High School and Bigfork Middle School may be fairly small, rural institutions in Montana, but that doesn't mean their teachers can't offer a good selection of specialized classes to their students. Thanks to online learning, in fact, the schools can deliver advanced courses like international business and biotechnology, plus other classes that "fill the gaps" for students who are experimenting with intended majors and specific careers. Matt Jensen, principal at 300-student Bigfork High School in Bigfork, MT, said that the school began researching ways to provide expanded elective opportunities about two years ago. "We investigated many different options," said Jensen, "in our quest to give our students the same selection of high-quality electives that larger schools can provide." During his research, Jensen came across Virtual High School Global Consortium, a Maynard, MA-based provider of online course design and instruction for teachers and online education for high school students. The organization partners with schools to provide student-centric online courses that help expand (versus replace) existing curriculum options. Jensen said he was immediately drawn to VHS's wide variety of courses, the ASP (application service provider) model through which the classes are delivered, and the fact that the company "didn't have the big-business feel that many of the other providers had." Implemented in January, the system cost $5,000 to get up and running, including $3,500 for teacher training and $1,500 for site coordinator training. 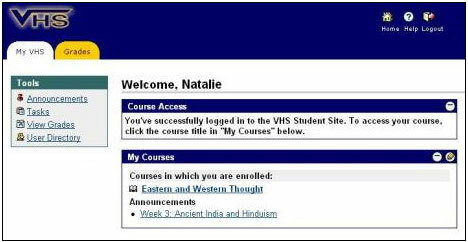 With the system in place, Bigfork began offering students access to VHS's 250 online courses as a means to add Advanced Placement (AP) classes to its course catalog. But before students could start taking advantage of those offerings, Russ Kinzer, superintendent, said the schools had to overcome a few challenges. "We had to jump through a few hoops so the Montana Office of Public Instruction (OPI) would recognize VHS and its teachers because they are located in other states," said Kinzer. "This process caused OPI to change certain rules and regulations, accepting the certification of teachers from other states as long as the teacher attended a nationally certified teacher training program," said Kinzer, who added that, as a result, VHS and its teachers are now registered with the state of Montana. Designed to supplement a school's in-person curriculum with online courses, VHS is a non-profit collaborative of high schools, teachers and students. Members include more than 9,500 enrolled students, 419 member schools, and 260 teachers in 28 states and 23 countries. Teachers who are certified in their specific discipline, and who have completed a VHS professional development program, facilitate and continually monitor all courses. According to Liz Pape, VHS' president and CEO, students using the system benefit from small classes and personalized one-on-one attention from active high school teachers, while mastering subject matter and 21st century ICT (Information and Communication Technology) skills that will "increase their chances for future success in higher education and the work environment." To get their online credits, students either use their own computers or one of the several "extra computers" that reside in the schools' classrooms. "We don't have the space to put every one of them in a lab," said Jensen, "but we do have teachers who have additional computers in their rooms. By using them, we're able to maximize our existing technology." Currently, 16 high school students are enrolled in online courses like world religions, academic writing, writing in Spanish, environmental chemistry, and screenwriting fundamentals--all electives that they wouldn't otherwise be able to take in the classroom environment. Four middle school students were also enrolled during the most recent semester. The virtual learning option has been particularly useful for the school's Running Start program, which allows students to earn college credits while still in high school. The program only applies to classes that aren't offered in the classroom, said Jensen, which makes the VHS program especially viable for students looking to earn those college credits. "Now they can do it online," said Jensen. Jensen said demand has been so high for the courses that the school soon expects to expand its number of VHS seats. He said students who have taken the virtual courses have been recommending the option to their friends and providing positive feedback about their experiences. "One of our students took environmental chemistry honors online last year," said Jensen. "That's something that our small high school would never be able to offer in the traditional classroom sense." According to Jensen, Bigfork schools are now developing a consortium membership with VHS and are looking to leverage their established relationship with the organization to help get other Montana schools involved with virtual learning. "Using our established site coordination services," said Jensen, "we're helping other schools in our area put some of their students through the program."